This is the third part of a four part series where Alochonaa East Asia Editor, Scott Musgrave looks at the tide of hostility in East Asia between Korea, China and Japan. Scott argues that it is the engagement, or the lack of engagement of the US, that affects how these states interact with each other, particularly in regards to Japan and the Republic of Korea. In the last article I discussed the currents of nationalism and its usefulness to the South Korean ruling elite. The constructed idea of Japan as the enemy as it was during the Second World War is useful even today to coax the nationalist populace into action or to divert attention from domestic failings. The argument of the article was not that the history argument is the wrong one or that Japan is in the right, but merely that there is more to the conflict than meets the eye. If South Korean officials chose to accept Japanese apologies that have been offered on over 40 separate occasions, then the conflict would cease to exist, but they have chosen to interpret Japan’s apologies as insincere, which we will discuss, and have continued to use the Japanese occupation of Korea as political fodder. This article turns the tables to look in depth at Japan. Whilst some will say Japan is at the centre of the conflict, and there is much merit to that argument, it is the systemic pressures of the Chinese power increase that has led to Japan being more intransigent than it has been in the past. As we explored in part one of the series, Japan is an ally of the United States and a country that will be counted on for offshore balancing. Part of my argument will be set around this fact as well as highlighting several other areas such as the supposed rise of the right-wing, the revision of Article 9 of the Japanese constitution and of course its relations to its neighbours. Japan was one of the first Asian countries in the post-World War II period to explode economically. A new constitution drawn up by US General of the Pacific Theater, Douglas McCarthur provided the framework of destiny for the Japanese nation. One of the key new points to this constitution, apart from the re-designation of the Emperor to a mere symbol, was the renouncement of war as per Article 9 of the constitution. This Article, whilst having been interpreted in many different ways since its inception, has been the basis of Japanese foreign policy. How does a nation survive in a world of anarchy without the ability to wage war? Japan has managed to get away with using only defensive technologies and a minimal amount of money spent on defense because of the US security guarantee and cheque-book diplomacy. During the post WWII period, Japan was an important part of US attempts to curb communism in the East. It gave them a foothold from which to project power and it provided a beacon of capitalism and democracy in East Asia. Now, with a change in the geopolitical landscape, there is no longer the same level of threat. The rise of China however provides a much more immediate and tangible threat to Japanese and regional security. Japan was long touted to become the leader of the US led order in East Asia, but due to its problems with its neighbours, those in Tokyo have looked less and less likely to be the ones to pass the torch to. Japan has historically followed US imperatives for its foreign policy to such an extent that by the early 1990’s many in Japan were calling for a more assertive, independent foreign policy. Notable writer and former Mayor of Tokyo, Shintaro Ishihara wrote a book on the subject called ‘The Japan that can say, no!’ (No!と言える日本) which was a moderate success. Other politicians of the time such as LDP Cabinet Minister and kingmaker, Ichiro Ozawa called for a much more independent foreign policy while still maintaining the US alliance (See: The Blueprint for a New Japan by Ichiro Ozawa). Since then, the Japanese economy has been in a constant decline and many have been reluctant to spend above the traditional 1% GDP on defense. This reluctance has been frustrating for US leaders who want to reduce their presence in East Asia whilst simultaneously wanting to provide reassurances to their Japanese and Asian allies. Now, with offshore balancing as the key strategy in engaging with China as well as other powers, the US has wanted Japan to start taking more responsibility for its own defense to reduce strain on US-China relations as well as reduce strains on its own economy. This tune seems to have changed recently with President Obama’s visit to Japan in April of this year. President Obama proclaimed that the US recognizes Japan’s sovereignty over the Senkaku/Diaoyu islands and is covered by the US-Japan defense treaty. This seems to indicate that the US pivot to Asia is a real thing, and that the US is strongly committed to the region. Regardless, there has been a steady increase in defense spending by Prime Minister Shinzo Abe as well as a move to loosen restrictions on arms export. Abe too has been trying his hardest to revise Article 9 by first loosening the check and balance of Article 96 which requires a two thirds majority in the Diet to put a vote on constitutional change. This has been so far unsuccessful, but it does show a willingness by Japanese leaders to determine their own direction in terms of security. At the moment the focus is on the right to collective defense which means that in the even that one of Japan’s allies is attacked, it can come to its aid. This however is still under scrutiny in the diet as well as among the Japanese public. What does this mean for the East Asian region? For security cooperation, this could be an unprecedented step toward Japan taking a central role as a proxy hub for regional security in East Asia. At present, Japan has the relative capabilities to repel any possible Chinese military action, particularly at sea. Given the ability to collective defence, this could make Japan an attractive ally for those in the region looking to balance against China such as the Philippines, South Korea even Vietnam. The Vietnamese in particularly, having had their waters trespassed upon by Chinese ships and even an oil rig, are seeing Japan as a possible security partner in the quest to curb China’s advances. This quest by Abe and the LDP to get Japan to be a more active contributor in the defence area has been met by considerable resistance both within and outside of Japan. Adding to that, the political costs within his own party have been large as well as it has cost him points with international partners. 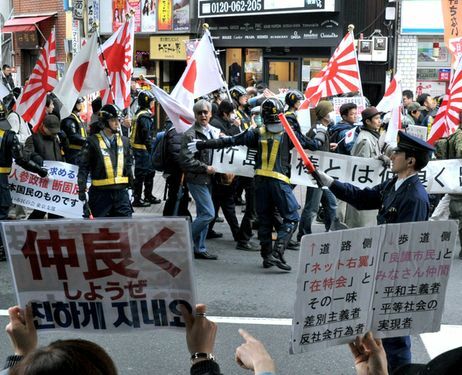 This move toward a more “militaristic” Japan has given credence to a movement of newscasters, journalists and scholars that are in fear of a resurgence of the right-wing. Many academics have turned to sales of historically revisionist manga as an indicator of this. Two popular titles ‘Hating the Korean Wave,’ (嫌韓流) a response to the influx of Korean music and television, and ‘Sensoron’ (戦争論), a revisionist depiction of Japan’s involvement in its invasion of East Asia, have sparked fear that the general populace is on board with the move toward a more right-wing, history denying, nationalist society. This has been asserted by many academics who look at South Korea – Japan relations but it doesn’t seem indicative of an overall trend towards the right. Indeed, if you were to add in the seemingly abundant cases of Japanese keyboard warriors lashing out against anything that seems to attack their revisionist narrative there does seem to be a rise of the right. These activists even went as far afield as criticizing a local council in Australia for establishing a statue to the memory of women used as sexual slaves by the Imperial Army. This however represents a very vocal minority in Japan. Japanese people on the whole it seems are either ambivalent or against any return to a militaristic state. Particularly those of the older generation are often seen protesting against the proposed revisions. Adding to this, while sales of ‘Hating the Korea Wave’ and ‘Sensoron’ are in the hundreds of thousands, sales of the left-leaning manga ‘Blue Dragon’ (清龍) and the classic ‘Barefoot Gen’ (裸足のげん) are in the millions. ‘Blue Dragon’ is a manga critical of the war and illustrates this through the experiences of a street kid who joins the Imperial Army only to become disillusioned after the ordeal. ‘Barefoot Gen’ outlines the horrors of war as experienced through a young boy as he walks through the aftermath of the Hiroshima atomic bomb. Clearly the move toward the right, at least based on this example, is overstated. Apart from members of the LDP who appear to be only pragmatic in their approach, albeit a little Machiavellian, and some overly zealous netizens, the shift is not significant. What patriotic/nationalist tendencies that occur among the general populace are merely a petit pride in their nation that mostly comes out at sporting events such as football and baseball. As pointed out by a JapanTimes commentary, there have been an increase in women with an interest and pride in Japan and its history but they are far from the vociferous right-wingers that Western media and scholars like to portray. These portrayals however are not helped by certain actions made by politicians, particularly visits to the Yasukuni shrine. The Yasukuni shrine has been at the centre of the East Asian history wars in recent years. Problems with visiting the shrine were most exacerbated under the tenure of Junichiro Koizumi. The Prime Minister largely ignored relations with Asia and sought to bring the US and Japan closer. He, like Abe today, looked to change Japan’s role to a more active one in the security arena. His contribution of troops, albeit only an engineering corps, to Iraq following the 2001 invasion showed a distinct shift from the cheque-book diplomacy shown by previous Japanese governments. At the time also, Koizumi was pushing for major reforms including the privatization of the postal industry that required a great deal of political capital to put through. Koizumi was helped in his support by the Izokukai (遺族会); a war bereavement group that is responsible for the interment of war criminals at Yasukuni shrine. By visiting the Yasukuni shrine and paying his respects, he was showing respect to his backers. The same can be said of Abe’s visit late last year. It was not a move to deliberately annoy Japan’s neighbours but merely a show of solidarity with a group that has been reported to bring in as many as one million votes for the Liberal Democratic Party. 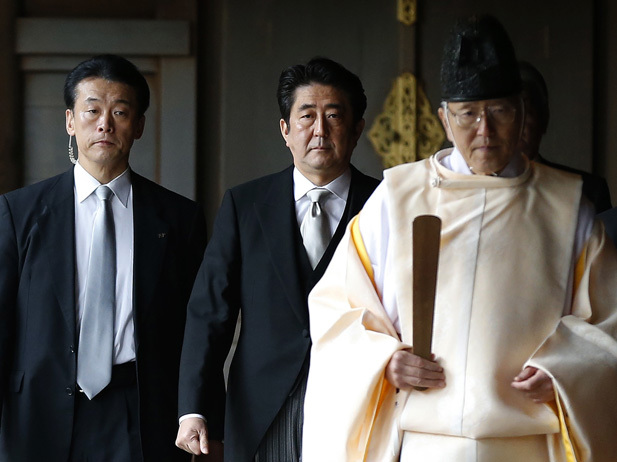 The decision to visit the Yasukuni shrine is a calculated gamble by Japanese politicians. It further feeds into our theory that Japan and Korea tend to care less about each other’s feelings when in times of relative safety. The recent intervention of the United States, including a heavily worded letter of ‘disappointment’ in the Japanese regime, has started to improve cold but warming relations have started between Korea and Japan. However, it is very unlikely that full thawing of relations will happen again until a change in regime for either side as Park seems to show great contempt toward her Japanese counterpart and Abe seems unable of little more than lip service. Japan’s relations with China are unlikely to move at all. Unlike under the Democratic Party of Japan, the LDP seems to have little interest in really growing a relationship with China. The continuing row over the Senkaku/Diaoyu Island chain has helped this very little. The unexpected consequence of this for China however is that Japan’s willingness to keep a hold of its sovereign territory is showing other states in East Asia and in the South China Sea that Japan could be a possible ally in the future to repel further Chinese incursions into their territory and EEZs. This article has hopefully shed a little light on some of the bigger issues surrounding Japan and its neighbours. This is by no means a full overview as there is much that I haven’t covered that deserves mention at another time. US desire to keep China in check has driven Japan and its politicians to be more assertive and has given rise to a small right-wing revival in Japan. While this is overstated, it certainly needs to be kept in mind when looking at political decisions. Domestic lobbies have significant sway over Japanese policy and it is important to understand that when looking at Yasukuni shrine in particular as it can either be seen as an affront to the war dead of East Asia or as a tool to reach the right people. Whatever the case may be, decisions made by the Japanese powers that be will have far reaching consequences. *Mr. Scott Musgrave, East Asia Editor for Alochonaa, is an avid East Asia watcher. Scott has written a Master thesis on contemporary Japan-Republic of Korea relations at Griffith University in Brisbane, Australia. He now lives in Japan keeping his finger on the pulse. Scott is available on twitter via @ScottM_IR where he also comments on his other love, football. Good article, you covered a lot of the points that are currently facing Japan Korea and China. Although you mentioned there is a few keyboard warriors in Japan, the same can be said for China, they have almost complete support for their claim to the diaoyudao/fishing Islands, and anti Japanese sentiment is high as usual. The issue with the US is straightforward in that, its ability to enforce its policies in the Asia pacific is dwindling. Korea and Japan are always at each others throats, so its unlikely they will form an alliance to stop China’s advancement. Its tough times all round in Asia, with martial law in Thailand, Chinese being evacuated from Vietnam and the disputes as you said. There need to be more UN intervention in general.